Get inspired with these ideas submitted from schools that earned the Water Works badge! We made a plan for how to promote drinking water at school. We sent a teacher to a training on the Sip Smart™ program, we created posters and put them up, we bought every student in our school a water bottle, we pledged to promote water through the Water Does Wonders website, and we’re looking at having an outdoor water station at our family picnic. We had a school wide assembly to kick off our activities where two of our Healthy Schools Club students hosted and shared some facts about water, our Public Health Nurse from the health unit spoke on the importance of water and less sugary drinks, our Gr. 5 class sang the song they wrote with a local singer/songwriter called “Water is Life”, we displayed a water mural that was created by one of our art classes, and our students received their water bottles. 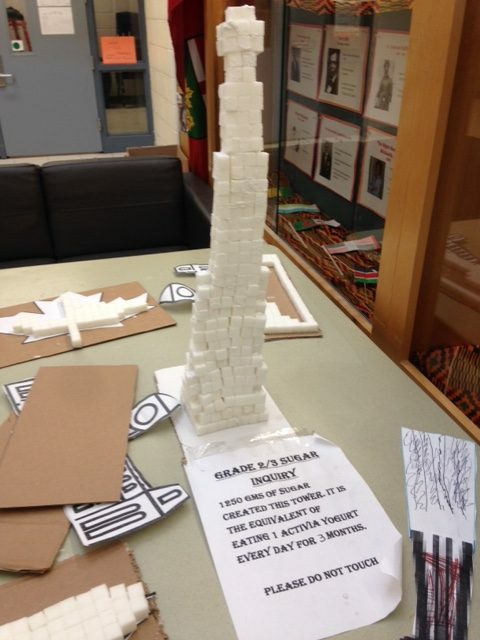 As part of our sugar experiment, We focused on drinks and measured the sugar in drinks – both mass and capacity. We then calculated how much our sugar consumption would be if we were to have one drink every day for a year, and 1 month. 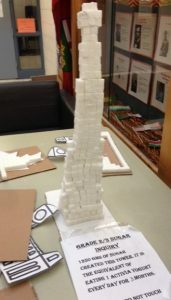 We are in the midst of building sugar structures from what we would consume in one month. This has been quite an eye opener for all students. We have promoted water instead of juice, especially after our inquiry. The best part has been how students have changed their habits. Re-Think Your Drink started as a small initiative after two new water bottle filling stations were installed at our school back in January of 2016. To promote our campaign, the Healthy School’s Team made a “Re-Think Your Drink” short movie with staff that was showcased at our Spirit Assembly to help bring awareness to the benefits of drinking water. We then created a display in the front hall and set a school-wide goal to drink 16, 000 bottles of water by June (recorded by the water bottle filling stations). To help fund-raise for future Healthy School initiatives, and to continue the promotion of our Re-Think Your Drink campaign, we had water bottles made with our school’s logo to sell. What started as a small initiative evolved into a school-wide campaign! We decided to purchase and install a water bottle station on every floor of the school. It started as an eco-initiative to reduce plastic water bottle use and to encourage students to use reusable water bottles. The water bottle fountain is quite popular in the school and has led to almost every student drinking exclusively water during the day (no need to purchase juice boxes or other less healthy beverages).Students are allowed to refill their water bottles at any time throughout the day. The stations are so popular and busy that we have recently purchased another one and it will be installed later this year. Our school’s Native as a Second Language class started a “Water Protectors” group. The group has been promoting the importance of water, as well as the need to protect the fresh water. Students have learned about water as the healthiest drink choice and the need to stay hydrated. They have made posters for the school and have visited each class to spread their message. The group has also taken part in events in the community which focus on protecting the Great Lakes. Future plans include issuing a school wide water consumption challenge to a neighbouring school.